THIS ITSY BITSY LITTLE RED DRESS IS AN EXCLUSIVE PIECE DESIGNED BY MISS KYM ELLERY UNDER HER "A TRIBUTE TO DR. STRANGE" COLLECTION FOR AUSSIE ONLINE SHOPPING BANDITS MYCATWALK.COM. I CAN'T FIGURE OUT WHAT I LIKE BEST ABOUT IT? THE THIGH HIGH HEM LINE, THAT INCREDIBLE COLOUR, THE WHOLE EXCLUSIVE THING (EXCLUSIVITY IS KEY!) OR THE FEELING THAT I'M CONSTANTLY BEING GROPED BY THE RIGHT HAND OF OF A PERFECTLY BEJEWELED SKELETON. DRESS BY ELLERY. RED DEVIL VEIL FROM KYM'S PERSONAL COLLECTION. those YSL rings set off any outfit and make it look amazing! I'm guessing, everything is just perfect about this dress, that colour!! I love. I love the rings ! I love the second picture! The dress is amazing!! ohhh goshh , I love everything about it! wow! !you look so good and your style is amazing! !are you a model? i love your pics1 i am a follower!! How is it that I'm just now discovering your blog. These are by far the best pictures I've ever seen! Gorgeous! The colour is gorgous, and so are you! Unbelievable first pic, great facials! 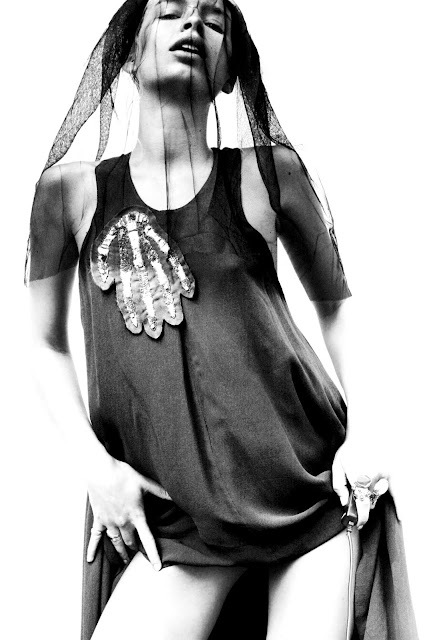 I love that the veil is from Kym's personal collection. I definitely wouldn't say no to having a friend like her, and accessing her 'personal wardrobe'! The dress is sick too babe! I thought you were gone, its good to know you are not.